When it’s really cold outside, the thought of a cold salad chills me to the bone. So why not have a warm one? This one is really easy to make. My kids love it too. 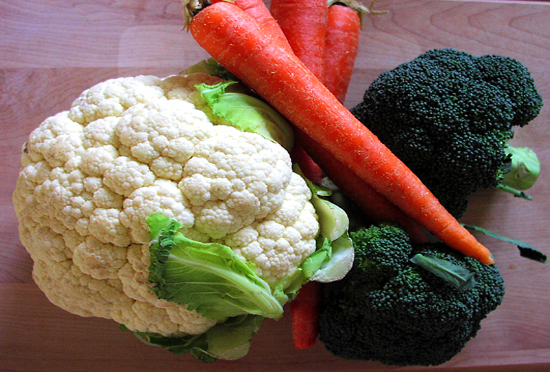 Wash and cut the broccoli and cauliflower into small bite-sized florets. Wash and peel the carrots and cut into small disks. Bring a small amount of water with butter, and garlic to boil. Add the cauliflower first and saute for a few minute, then add the broccoli florets, last throw in the carrot disks. While the veggies are cooking make a dressing with the vinegar,oil, salt, and pepper. When all the vegetables are tender, take the veggies out with a slotted spoon and mix them with the dressing right before you serve them. Timing is the hardest part of making this salad. All veggies have different cooking times so you need to figure out when each will be tender but not overcooked. You also don’t want to start this side dish too early so it arrives cold on the table with whatever else you are serving. If your other dishes are not finished yet you can put some foil over it and keep it warm in your oven. Sounds delish! Thank you for translating this for us, Ulla.